The Apartments - Playa de Tapia Tourist Apartments, in Tapia de Casariego, Asturias. 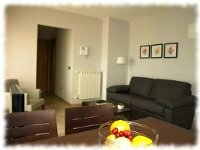 The building has ground and first floors and consists of a total of 8 fully equipped apartments and a studio apartment. 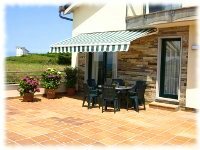 Every apartment has a private terrace overlooking the natural surroundings of the beach in Tapia de Casariego. In addition, the main entrance has a ramp and 2 of the apartments are accessible for people with reduced mobility. Photo gallery of the resort, lobby and public areas. The apartments for 4/6 pax have two bedrooms: one with two beds or a king-size 1.50 bed, and another one with a king-size bed (1.50). They also have a lounge-kitchen with a double sofa-bed, and a bathroom. The apartments for 2/4 pax have one bedrooms for double occupancy (two beds or king-size 1.50 bed), a lounge-kitchen with a double sofa-bed, and a bathroom. The studio apartment has a double bed, a lounge-kitchen, and a bathroom. Central heating and hot water using solar energy. LCD TV in the living room that plays multimedia content via USB. LED TV in the main room of the appartament. Bathroom with hairdryer and amenities. Cot and baby bath (available on request and depending on availability). Ceramic hob (4 plates) and extractor fan. Dishwasher: only in the 2/4 and 4/6 pax appartaments. Dishes, cutlery and coffee maker. Computer and Printing Service (with charge) at reception.